The obsidian shard, half the size of my palm, lay in my hand: a sharp, deadly thing still stained with blood. Its black surface shimmered with green reflections, and it quivered with the aura I associated with the underworld: blood and pain and death. Odd, to say the least. One did not find such objects in a dead warrior’s house. I raised my eyes to look at Magistrate Macihuin, who stood in the courtyard, a few steps away from me, watching me intently. “How did you think of opening the chest?” I asked. I was a priest for the Dead: I assisted in preparing the corpses, in saying the proper prayers and making the proper sacrifices. And if the underworld was involved directly in a death, as seemed to be the case here, I advised magistrates such as Macihuin. “There’s magic involved, to put the shard straight into the heart with so little damage to the skin.” I closed my hand around the shard. I had handled obsidian blades before. This felt wrong–too smooth, too charged with latent power. I had felt this once before, but… “There is underworld magic in this, but I don’t know what kind exactly. Not yet,” I said. “Do you want to see the body?” Macihuin asked. We moved from the courtyard to the inside of the house, where two guards watched over the victim’s body. There was not much to see. It lay on the reed mat in the bedroom, its face bearing the blank expression of corpses. Behind it, the rich fresco on the adobe wall depicted Tezcatlipoca, God of War and Fate, and His eternal enemy Quetzalcoatl, God of Creation and Knowledge. Tezcatlipoca’s clawed hands carried the obsidian mirror that held His power, and His face was creased in savage laughter, as if the death amused Him. Quetzalcoatl stood next to Him, holding a skull in His hand. His eyes were sad. Macihuin’s guards had opened up the chest to remove the shard: jagged cuts marked the edge of the wound, and the strong smell reminded me of the altar room of a great temple, encrusted with the blood of hundreds of sacrifices. The heart had been cut in two, but everything else seemed normal. I had seen enough open chests to learn something of human bodies. I could sense his impatience, his worry. For him, this murder involving magical obsidian was unfamiliar territory, the intrusion of something dangerous into his life. For me…I did not know the dead man. However, the shard was all too familiar: seven years ago, I had found a similar one in my student Payaxin’s chest. “The Wind of Knives? And why should He come here and kill Huitxic?” Macihuin’s face had hardened, but I could hear the fear in his voice. He had probably hoped I would deny the underworld’s involvement in this death, that I would say it was a purely mundane murder. No such luck. Macihuin’s gaze would not meet mine. He had sounded far too worried, even for such an unusual death. “What are you not telling me?” I asked, softly. “We all need to know,” I said, softly. “If those dead men have summoned anything from the underworld, it is a danger to us all.” I knew what kind of monsters peopled each level of the underworld: beasts of shadows feeding on human flesh, giant birds that ate human eyes, monsters standing on two deformed legs, with claws instead of hands. The thought of their walking among us was not a pleasant one. The Wind of Knives would kill the human transgressors, but His role ended there. It was priests and especially Guardians who kept the balance of the world, by preventing monsters from coming among us. I sighed. I stared at the obsidian shard I still held in my hand. The Wind of Knives. After my student Payaxin had died, something had withered in me. I could no longer trust the Wind of Knives, not when He killed so casually. Still… Still, I was a priest for the Dead, and responsibilities could not be evaded so casually. We finally parted ways at the entrance of the house; Macihuin walked back to his tribunal, and I went back to my temple. As I walked through streets clogged with people, from warriors in feather uniforms to humble peasants wearing only loincloths, I dwelled on the summoning I would have to perform. I did not look forward to it. Priests for the Dead lived alone. There were plenty of temples like mine within the city of Colhuacan, hidden at the end of small alleyways, their facades unadorned. Inside, a single priest would wait for the bereaved. Sometimes a student waited as well, learning the craft of his master. I had taken on no one since Payaxin’s death. In my temple, I laid the shard on a low table. The midmorning sun created further reflections on the obsidian, images with glimpses of deaths: warriors dying ignominiously of old age or sickness, far from the glorious battlefields, women clutching their chests as they fell, their faces contorted in pain. The underworld. The Wind of Knives. Four Wind. If it was not the dead man’s birth date…I knew only one other thing it could mean. Four Wind was the day on which the Second Age of the World had come to an end. There had been Four Ages before our own, each named after the day that had seen it end. Each Age had been created by a god, who then became the sun in the sky, the giver of warmth and life. Different people had worshipped each Sun–until the gods grew tired and ended each Age in a cataclysm. This Age was Four Movement, the Fifth Age, and it was said that Tezcatlipoca, God of the Smoking Mirror, would end it in an earthquake, tumbling the Fifth Sun from the sky, and rising himself as Sun of the Sixth Age. But why would a dead man wear this around his neck? The Wind of Knives would perhaps know, if I dared to ask Him. I could wait to summon Him, always running from that moment when I would speak the words–knowing that if I did anything wrong the Wind would kill me as He had killed Payaxin. No, better to do it now, and have it behind me. I reached the district of bird-sellers. Raucous cries echoed around me as I went from stall to stall. I finally found what I wanted: a small greyish owl in a wicker cage, dwarfed by the other, more colourful birds the seller kept for their feathers. I bartered a copper bowl for the owl. It kept hooting on the way back–clearly it did not care much for daylight. I had not summoned anything from the underworld since Payaxin’s death, and especially not the Wind of Knives. I had resumed my life without Him. I knelt behind the small altar, and opened the wickerwork chest that held my own possessions. Inside was a jade plate, much bigger than the pendant on Huitxic’s corpse: it depicted the voyage of the soul through the nine levels of the underworld, from the crossing of the River of Souls to the Throne of Mictlantecuhtli, the God of the Dead. I also took out a small bone carving of a spider. On the altar I laid both these things, the shard of obsidian, and the wicker cage with the owl. And something else, something I had kept all those years: another obsidian shard, the one I had found in Payaxin’s heart. The owl struggled as I opened its chest with the obsidian knife, but I had had years of practice. Blood spurted out, staining my hands and my tunic; I retrieved the heart on the tip of my blade, and laid it on the altar. Then I traced a square with the blood, and drew diagonal lines across it. I ended my drawing in the centre of the square, laying the knife point near the middle of the jade carving, on the fourth level of the underworld. My hands shook as I recited the words to complete the summoning. From the Fourth Level of the underworld I call you. At first nothing happened and I thought I had failed, but then darkness flowed, catching me in its grasp. The hollow in my stomach was an all-too-familiar feeling, dredging up old memories, old fears. A wind rose, whispering in my ears words of mourning. The Wind of Knives coalesced into existence behind the altar. I saw nothing but a blurred, shining impression of shadows, planes of obsidian shards making the vague humanoid shape, a monstrous head, and eyes that glittered. And I felt His presence in my mind, battering at my own barriers, trying to get in. But I would not yield. “You summon me,” the Wind of Knives said. His voice was the lament of dead souls. As I well knew. He did not answer, even to pity. One hand glided towards the altar. The fingers were blades of obsidian, each catching the sun’s rays and making the light cold and lifeless. They closed around Huitxic’s shard, lifted it to the light. “That is not mine,” the Wind of Knives said. He extended His hands towards me. Each held a shard of obsidian. The leftmost one, the one Macihuin had given me, glinted green even in that cold light. The rightmost one, which I had salvaged from Payaxin’s body, did not. “This is mine,” the Wind of Knives said, lifting His right hand. “Then he should have paid more attention to his ritual. He should not have summoned me,” the Wind of Knives said. I could have argued for hours over Payaxin’s death, and still I would have gained nothing. So I held back. “Then whose is it?” I asked. But His voice did not resound as before. If He had been human I would have said He was lying. I knew better, of course, than to accuse Him, even though Payaxin’s death still filled me, still clamoured to be accounted for. “Is that all? Didn’t you know the dead man?” I struggled to remember his name. “Huitxic. Does he mean nothing to you? Pochta? Itlani? Had they transgressed?” All He cared about were rules. “And the pendant? The pendant with the Second Age of the world?” I asked, but He was shaking His head in a blur of obsidian planes. And then He was gone. I remained alone, shaking with the memory of that presence. I slowly put away Payaxin’s shard, and cleaned the altar, wondering what the Wind had not told me. “The Brotherhood of the Four Ages,” Macihuin said. Four Ages. The pendant made sense. I told Macihuin that, and he nodded. “I suggest you keep a watch on him,” I said. “She’s the Guardian of Colhuacan,” I said, darkly. I left Macihuin to his own devices. He was going to interview the last survivor, and I was going to find out all I could about this sect, and why its members had died. Unfortunately, that might involve going straight to the person who was killing them. For Ceyaxochitl was known over Colhuacan for another thing than her role as Guardian: many years ago, she had dispatched the members of a harmless sect, coldly going after them and opening their chests with obsidian blades. She had said they were a possible danger to the Empire, and the matter had been hushed. She had called it justice. Ceyaxochitl lived in the district of Teopan–the Place of the Gods. Her house stood only a few paces from the Great Temple. Every day she must have seen the great pyramid rising to the heavens with the shrine to the Sun at the summit, heard the cries of sacrifices as their blood flowed on the altar. But I doubted she had ever worshipped the gods in their heavens. A Guardian acknowledged the gods’ existence, but served none of them. The gods do not maintain order. To us humans falls the task of averting the end of the world. By our constant offerings of blood, we maintain the sun in the sky, and by their constant watch over the world the Guardians know when the gods falter. Ceyaxochitl’s slaves were courteous but cold; I could sense I was not welcome. I sat down in the courtyard, under a pine tree, and calmly waited. At length a slave took me to the audience chamber. The walls of the room bore frescoes depicting Tonatiuh, the Fifth Sun, rising from the flames of His pyre into the sky, the world blossoming under His warmth. Tezcatlipoca watched from behind, His hands already reaching out as if to end the Age before it had begun. Ceyaxochitl was older than I remembered: time had sprinkled white into her black hair, and some wrinkles had crept onto her face. But she sat very straight on her dais, and her eyes saw everything. Behind her was a low table, on which lay the materials for some ritual unknown to me: three obsidian knives, and the fleshy leaves of a maguey cactus. “I need information about a sect,” I said. “I give nothing without a good reason,” Ceyaxochitl said. Ceyaxochitl sighed. “I know nothing of it.” But her voice quavered perhaps more than it ought to have. “Are you accusing me?” she asked, her hands tightening on the cloth of her skirt. “You–” I said, fighting an urge to strike at her. I remembered finding Payaxin’s body, thrown backwards with such force his neck had broken. He had died instantly, of course: the obsidian shard embedded in his heart had seen to that. I had knelt, collected the scattered materials for the ritual he would never complete, said the prayers for his soul. I had not wept. Tears would have been useless. But I had not forgiven the Wind of Knives. Ceyaxochitl’s eyes focused on me, and they sparkled with something like amusement. “You will not use that against me,” I said, softly. Liar. Her hands still trembled. “Then who were they?” I asked. “Then they were a danger,” I said, quietly. That last sounded sincere, but it did not exonerate her. Ceyaxochitl did not rise at once, which allowed me to take a good look at the three knives spread out on the table by her side. They had a good edge, and all shone with a peculiar colour. Not green like the shard I had, but an aquamarine hue that was similar. I laid one hand on the leftmost blade, before she could stop me, and felt the power pulse deep within. The same power as the shard that had killed Huitxic. “You have overstayed your welcome,” Ceyaxochitl said, coldly. I withdrew my hand from the knife. “What are these knives?” I asked. I left. There would have been no point in talking further with her. By the time I came back to my temple, I was exhausted. I sent a message to Macihuin, and then spent the rest of the evening making my own offerings of blood to the gods. I could not keep my thoughts from returning to Ceyaxochitl. Three dead warriors: Itlani, Pochta, and then Huitxic, with that obsidian shard in his heart. Obsidian that did not belong to the Wind of Knives, but throbbed like Ceyaxochitl’s knives. Three members of a sect worshipping Tezcatlipoca and hoping He would end the world. And the fourth still alive, watched over by Macihuin. They had been incompetent. I did not think Ceyaxochitl was lying on that point. But it changed nothing. As Guardian, she still might have taken it upon herself to remove them. My sleep was dark and dreamless, and I woke up to an angry cry. Macihuin’s face hovered over me. In the blink of an eye, I was awake and sitting upright on my reed mat. “What is it?” I asked. Outside, it was still night; I could hear owls hooting to one another. The air smelled of steam-baths and cooked maize. Nayatlan, the last member of the sect, had found the same ending as his brethren; he lay on his back on his reed mat, in the bedroom. He had the same mark as Huitxic on his torso. I opened up the chest in three swift cuts, and retrieved the obsidian shard in the heart: a shard similar to the one that had killed Huitxic. Macihuin stood to the side of the mat, his face dark. I held out the bloody shard to him, and he nodded. From the next room came weeping sounds: Nayatlan’s wife. “Four Rain,” I said, lifting the jade pendant. The Third Age, which had ended when the gods sent down fire that consumed the earth. We searched every corner of the house; the dead man’s widow helped us by showing us the chests where her husband had kept his most precious possessions. We found nothing. The last wickerwork chest we examined, though, was not as deep as it ought to have been. I raised my eyes to Macihuin, who was kneeling by my side, his hands full of clothes; together we tipped the chest’s contents onto the ground. It turned out to possess a false bottom, full of sketches and papers. Nayatlan’s widow swore in a voice still shaking with grief that she had never seen them. The glyphs on them were so faded they were almost illegible. “I need some time to study these,” I said. We did have a brief talk with Nayatlan’s widow, but she did not even know her husband had been part of the sect. It was going nowhere. I studied the manuscripts as best as I could, between the wake and the sacrifices for a dead man–for I still had my own work. The spells written in the manuscripts were old ones, so powerful they would have been beyond the grasp of an untrained sect. One of the spells was annotated as if in preparation, but half the glyphs were missing, which made it hard to decipher. A summoning, probably of some monster. Thank the gods they had not succeeded. I almost was grateful to Ceyaxochitl, until I remembered her arrogance. She had killed innocents. The rest of it was dull: all of it was praise to Tezcatlipoca, to His magic that could bring both life and death. God of the Smoking Mirror, the faded hymns said, you who hold the destiny of the world in your hands, you who will rule over the Empire. There, too, Nayatlan had written things, and I could piece together enough. He had had a son, I understood, who had drowned in the marshes while still very young. The fool had hoped Tezcatlipoca would bring him back in the Sixth Age. Fool. But still not enough to justify his death. I got messages from Macihuin, all attesting to the same lack of progress: Ceyaxochitl did not go out of her house on the following day; nor on the next one. He had had the houses of the other three dead men searched, to no avail. Macihuin himself finally came to tell me the investigation was being withdrawn from him. The last victim had been not only a warrior, but a member of the Eagle Regiment, and his exalted status demanded more than a minor magistrate. Macihuin had to withdraw his guards while a more competent magistrate was found. I took the watch myself on the second night. Nothing happened. I sat all night on a neighbour’s roof, watching the inner patios of Ceyaxochitl’s house, and my clothes were wet by the time I finally came back to my temple. I had laid on the altar the three shards of obsidian: the two that came from the murders, and the last for Payaxin. Each time I came back to my temple I was reminded innocents had died. On the second night of my watch, I saw Ceyaxochitl going into her courtyard with an owl cage. I saw her lay down the jade, the spider carving and the obsidian blade. I saw her kill the bird and trace the square in blood. I saw her summon the Wind of Knives. He came to her call, and moved to stand near her, the hundred of obsidian knives glinting under the light of the moon. She whispered something to Him. No. I rose from my precarious hiding place, and almost fell from the roof. But still I could not hear the words any of them spoke. Ceyaxochitl dismissed the Wind of Knives, and He faded away from the courtyard, taking with Him the coldness and the sense of despair. Not possible. The Wind had not sounded so much of a liar. Had He? What did I know of underworld creatures, after all? I only knew how to read men. Supernatural creatures remained beyond me to encompass. I came back to my temple at dawn, shaking from the cold, and sent a messenger to Macihuin, begging him to come. I waited and waited, but there was no answer. At last, a bedraggled boy brought me a crumpled piece of paper from Macihuin. I cannot help you, not now. Tonight, when I have finished my work. My heart missed a beat. Did she think to kill both Macihuin and I? I sent my answer, telling to Macihuin to take care, and I waited. On the altar, the shards of obsidian glinted with sunlight: two of them green, the last without any colour at all. 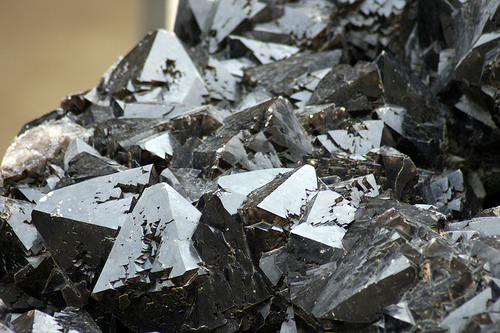 The sun seemed to take an eternity to move; I watched the shadows of the obsidian shards expand and then shrink again. The light turned from golden to white to golden again. I picked the two which shone with green reflections, one in each hand, and looked at them carefully. They did not look like the one in Payaxin’s body; in fact… I put both of them in my right hand. They fitted together along part of their length, to form a narrow piece almost twice as long. Pieces of the same shattered blade? The sun was still high in the sky. I wrapped the three shards in a cotton cloth, and went into the district of artisans. I had trouble finding a knife-maker who would receive me; they had work to do, more important work than accommodating a priest for the Dead. He laughed as he moved back into the shadows of his house. I followed him. “From which quarry, you mean? That’s hard. Perhaps, if the pieces are big enough…” He unwrapped the cloth, bent over them. His finished knives lay on a low table, each of them a testimony to his skill, the blades sharp, the handles carefully crafted. Obsidian flakes lay everywhere. “Those were polished,” he said. I thanked him, picked up the shards, and went home. All the while my mind was running on unfamiliar paths, desperately trying to fit the pieces together. Tezcatlipoca, God of the Smoking Mirror. The mirror of obsidian that gave life and death. Shards of a mirror that throbbed with power under my hand, speaking of death. Not the underworld. Never the underworld. Deaths, because Tezcatlipoca was also the God of War and Fate. Despite everything that Ceyaxochitl had told me, despite everything Macihuin and I had found out, the sect had indeed summoned something. But not something from the underworld. The Wind would have killed them then. No, they had set their sights higher. They had summoned Tezcatlipoca Himself, so He could end this Fifth Age. And Tezcatlipoca, who was god of destruction as well as of rebirth, had killed them one by one. Only one person in Colhuacan had the knowledge and power to fight Him; only one person stood between the god and the end of this Age. I had been wrong. She had not summoned the Wind of Knives to kill the sect. She had summoned it to protect her. But the Wind could do nothing against a god. There was no time. I sent Macihuin yet another message, knowing inwardly that I was alone, that he would not find me before it was too late. Within my temple, I girded myself for battle. I had only pathetic things: I, who had not been even able to protect Payaxin from the underworld. Three obsidian knives went into my belt, and around my neck I hung a jade pendant in the shape of a serpent–Quetzalcoatl, the Plumed Serpent God: Tezcatlipoca’s eternal enemy. And then I ran back to Ceyaxochitl’s house. Everything was silent when I arrived; the air itself seemed to have turned to tar. I struggled to reach the front door. Inside, magic filled the courtyard, throbbed to the rhythm of my heart. Magic such as I would never wield. Still I pressed on, although the air burnt my lungs, and raw power quivered on my skin. I was too late. Ceyaxochitl lay on her back on the dais of the audience room, blood staining her blouse. Around her lay the remnants of her ritual: the owl with its throat slit, the spider carving on the low table, the jade plate. But the pattern was incomplete: a square filled the plate, and around the fourth corner of the drawing the blood of the owl pooled on the table, slowly dripping to the floor. Ceyaxochitl had not traced the diagonals. She had had no time to complete her summoning. And darkness stood over her: the god Tezcatlipoca in all His twisted glory. “Stop,” I said. I wanted to scream it, but my tongue stuck to my teeth. “Stop,” I repeated, lifting one of the obsidian knives. The god laughed. It wasn’t the laughter of an immortal, but that of a madman. He turned to me in a fluid, inhuman movement, and I saw the flash of jade where His throat should have been, submerged in the darkness. I did not need to be closer to see the pattern. Four Jaguar. What had those fools done? “Priest,” the god said. “You have no place here.” He moved towards me, His power overwhelming me. I fought to raise my hand, and threw the knife at Him. It fell to the ground paces away from Him. He did not slow down. “No longer,” the god said. “Itlani is but my vessel. I have returned, priest.” I flung my second knife at Him, but He batted it aside. And then He reached out with hands like claws, and, grabbing me by the shoulders, hoisted me in the air. I could not breathe. I could not focus on anything. Everything was folding back on itself, everything blurred. The hands holding me were blades of obsidian, green and throbbing with magic. The god’s broken mirror. The shards that killed. He flung me against a wall, contemptuously. I slid down, landed hard. Pain flared up in my back. Blood ran on my shoulders where the god had held me, on my arms and legs, which had been grazed by the rough surface of the walls. My ribs ached. As He had killed Ceyaxochitl. I rolled aside once more, but I was weakening, fast. I had only one knife left in my belt. Think. I had to…think. The mirror that gave life and death. The sect had summoned Tezcatlipoca and made a mess of the ritual. They had broken the mirror, and the shards became embedded into Itlani’s body. The shards that later enabled him to rise as this twisted shadow. They gave life, and they took life. The god was not wholly here, not yet. He inhabited Itlani’s body. And that human body, neither dead nor alive, belonged both to the mortal world and to the underworld. The body transgressed. I crawled towards Ceyaxochitl’s low table, as fast as I could. My body screamed its agony, but I paid it no heed. My hand closed around Ceyaxochitl’s obsidian knife, dipped it into the blood of the owl. I swiftly completed the pattern, tracing the square’s diagonals so that they met over the fourth level of the underworld. The god lunged for me, and I threw myself aside. Tezcatlipoca’s hand stabbed through the place where I had been, and grazed the skin of my arm. I did not care. I needed to speak the words. “Jade for safekeeping…” My voice caught on the last word. It was hard to speak. The god moved towards me. I left the table’s side, but everything was blurred again. I raised shaking hands, but could not maintain them in the air. I was…I had to…. I closed my eyes, knowing I had done all I could. The god was close to me; I could feel His power, straining to fill me. But I was too weary to get up. A wind rose, whispering words of mourning in my ear. The air became cold, as cold as morning frost, and my stomach filled with that familiar hollow. I almost welcomed it. Acatl, a voice said in my mind, a voice like the lament of dead souls. I am here. When I managed to open my eyes again, the Wind of Knives was fighting Tezcatlipoca. They flowed over the furniture in the room, one darkness lunging at another. Obsidian clashed against obsidian with a sickening sound. I crawled back to Ceyaxochitl. I passed over my own trail of blood, ignoring the pain in my body. “Spare yourself,” I whispered, not feeling stronger than she was. The Wind of Knives and Tezcatlipoca were still tearing at one another. The god’s body had transgressed, but He remained a god. The Wind of Knives did not kill gods, and in my mind I could feel Him weakening. Not enough. Curse it, not enough. What would be enough? Us. Human blood. Well, there was enough of it around, I thought hysterically. I called in my mind to the Wind of Knives, as He had done when He had arrived. You need more, I said. He continued His dance with Tezcatlipoca, stabbing futilely at the darkness. And you would give it, Acatl? I need more than blood, the Wind said, barely stepping aside to avoid one of Tezcatlipoca’s claw-swipes. I need us to work together. I need your trust. No. Those are words, Acatl. Do you trust me? I…Payaxin’s dead body filled my mind. You kill for nothing. I am necessary. Would you rather have gods and monsters walking the world? I do what I was made for, the Wind said. No. Blame was shared, equally. If I had taught my student better, he would not have rushed into such a foolhardy enterprise. He would have known better. I, too, bore the guilt of Payaxin’s death, and it had been gnawing at me all those years, when I had cut myself away from the underworld. I could not go on like that. I could not be ruled by guilt and hatred. The Wind of Knives was still moving, but His gestures were more sluggish. Acatl! I closed my eyes. I trust you, I said, and opened myself to Him. It was as if I were moving through a rush of water; every thought alien to me, every image His mind held too horrible to focus on. Skulls and stains of blood flashed before my eyes, but I held on. And He showed me, without words, what I needed to know. Human blood. Human blood would dissolve the shards, if it went to the heart, driven by a human hand. I rose, slowly. My hand went to my belt, retrieved the last of the obsidian knives I had brought here. Clumsily, I plunged the blade into the wound on my left shoulder, biting my lip not to cry out at the pain. Then, step by step, I moved towards the battling shadows. I came, with the blood-stained obsidian knife. I came, and the Wind of Knives redoubled His attacks, until He had Tezcatlipoca pinned against a wall. And in that moment I plunged my knife into the shadow god’s chest, all the way to the heart. I felt obsidian give way, dissolve under the thrust of the blade. I felt the Wind of Knives seize hold of my mind and push, push deep into the twisted mind of Tezcatlipoca’s incarnation. And everything gave way under our attack. And the last shard dropped away, and Itlani’s dead body fell at my feet, a grimace of fear on its features. It was all I could do to remain standing. Shivering, I kept staring at the corpse, wondering if it was truly over, if the nightmare had ended. “Will He come back?” I asked, slowly. I wanted to rest, to lie down. I wanted the underworld to go away so that the coldness would abate. “It is ended,” I whispered. He had started to fade on the last word; obsidian planes blurred into nothingness. By the time Macihuin and his men reached the house, and summoned a physician to take Ceyaxochitl away, He had disappeared. I stood over Itlani’s body, shaking and weak from loss of blood. “Yes,” I said. I let the physician bind my wounds, and fuss over them. I let Macihuin ask me questions which I was too weak to answer. Evening was falling; darkness filled the house, but it was a darkness that the sun would dispel, come time. The Fifth Age would continue. In the end, there were enough things to sort out, and I could tell Macihuin would be very busy in the hours to come. They left me alone, sitting on the dais with the remnants of my summoning, with the memory of the Wind’s voice in my mind. Payaxin was dead. We both had a share of guilt in that, and perhaps not even one. After all, he had been his own man, and had made his own choices. I could no longer go on, cutting myself off from the underworld and hating the Wind. As He had said, He was necessary.